1966 - EUSAC loosely formed by keen recreational divers Charlie Fay, Ian Bruce, Ian Milligan, and David Green. 1968 - EUSAC recognised as a sports club by Edinburgh University Sports Union. 1969 - Club gets its first inflatable boat mounts its first expedition to Scapa Flow and joins the BSAC as branch 407. 1970 - 3 month scientific diving expedition to Jamaica performed with the help of BSAC branch 51. 1972 - EUSAC is a founding branch of the Scottish Federation of Sub-Aqua Clubs. Half of the first class divers in BSAC are members. 1973 - Postgraduate members mount an expedition to Barbados to study reef forming corals. 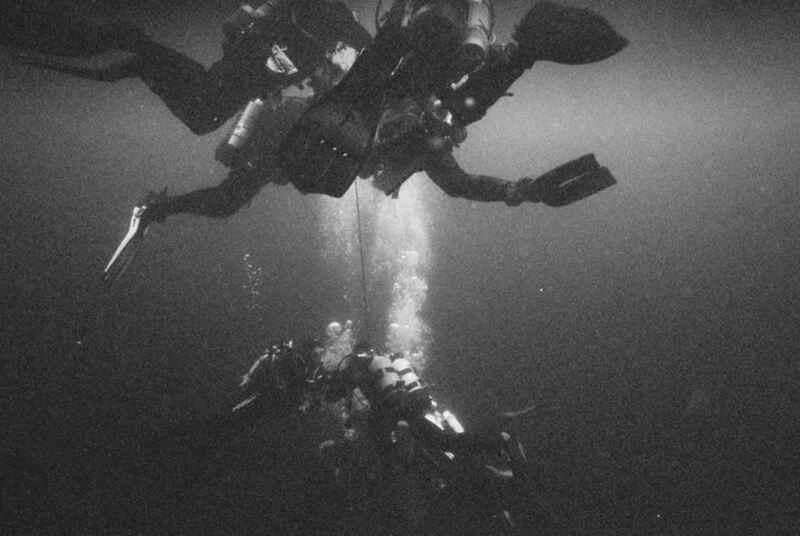 1974 - EUSAC divers spend two months underwater for the second season of archaeological work on HMS Dartmouth. 1975 - EUSAC divers survey crannog remains in Loch Tay. 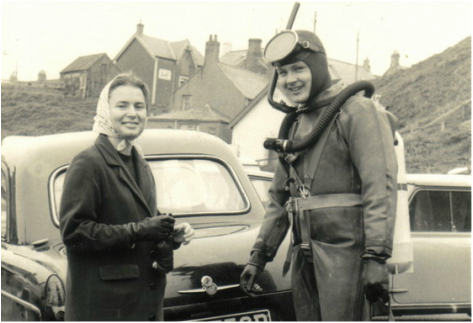 1975 - EUSAC divers find the wreck of Chadwick. 1978 - The club gets involved in 'The Gitana Project' filmed for the BBC's Horizon programme but never aired. 1979 - EUSAC divers find the wreck of Helena Faulbaums, after many efforts. Robert Sproul-Cran, Derek Borthwick, Geoff Hide and Malcolm Gauld were the first divers to dive it. 1979 - EUSAC asked to organise initial survey of HMS Royal Oak as part of a joint EUSAC/Royal Navy Film Expedition. 1980 - An underwater shot from the 'The Gitana Project' project makes the cover of the Scotsman's colour section. 1980 - EUSAC divers aided excavations of the Spanish Armada wreck, Trinidad Valencera, off of the West Coast of Ireland. 1984 - EUSAC has trained 500 divers over its 18 years. 1991 - EUSAC wins the Heinke award for the second time becoming the only university branch to do so. 1998 - EUSAC members join Coral Quay expedition to study coral reefs off the Philippine Islands. 1999 - Club looses significant portion of experienced members because of internal politics. 2002 - Branch secures a university grant for £1650 for equipment to introduce nitrox diving to promote safer diving within the club. 2003 - EUSAC members join EUCARE expedition to chart corals off Madagascar. 2004 - EUSAC members join Seasearch expedition to Brora in the north east of Scotland. 2005 - Max Ruffert of EUSAC again successful in securing BEGS funding for another exploratory trip. 2007 - Number of EUSAC divers take part in an Expedition to Oman, (Nemo project). 2008 - Paul Bullen of EUSAC runs an exploratory trip to Cape Wrath, sponsored by BEGS. 2016 - Carrie Pickering of EUSAC awarded University Blues. Only the second EUSACer in 10 years to be awarded the medal. 2017 - Cara Nicholson of EUSAC organises a Boat Handling Skills Development Course, ran by Max Ruffert of EUSAC, adding eight new qualified boat handlers to the club. 2018 - Cara Nicholson and Paul Miller oversee the purchase of a new EUSAC boat. Jura, a 5.8m Humber Destroyer with 115hp engine, was added to the EUSAC fleet in June, and members voted for a name in keeping with the club's whisky tradition. 2018 - EUSAC's 50th Anniversary Year! A whole year of events to celebrate our big birthday, culminating in an extra special Burn's Night in January 2019 attended by generations of EUSACers! 2019 - Paul Miller of EUSAC runs an expedition to Malta, taking 25 EUSAC members for ~230 dives, the largest trip in recent history.